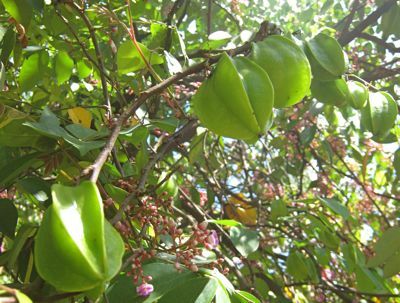 I have written about balimbing (carambola, starfruit), the fruit, before. It isn’t one of my favorites, but I have seen balimbing for sale in the markets often. Though I wonder about when it is really in season as I have seen them in the markets around now, at the height of summer, and oddly, I have seen them in the fall or later in the year as well… Do they bear fruit several times a year, like some mango trees? 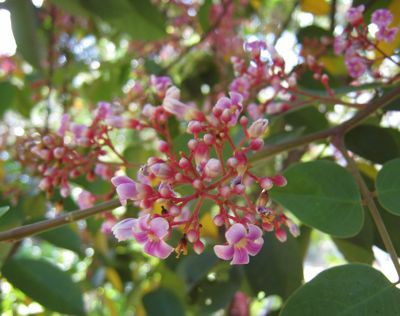 But oddly, I have never seen a carambola or balimbing tree. Or at least not knowingly. I had eaten so much balimbing in my life while still there in the Philippines, and only once did I tasted one that is sweet. I think it was straight from a friends tree, hindi yung hinog sa pilit. Here in Houston, its one of the tropical fruit that most special salad arrangement calls for, and its because of its shape. Sometimes I see one that is with a tinge of orange. Nice. They are one of the pricey tropical fruits I know. They use them a lot in tropical cocktail drinks at high end watering hole merely for its look. They are kind of tart good eaten with rock salt to cut the tartness. I do not want to be branded as balimbing person meaning double faced individual – you side wherever is favorable to you. I miss my grandparents’ balimbing tree. They had one growing out of the ground to the side of their house when I was growing up. I remember loving this fruit and picking the fruits off the tree in summer. My grandparents have 2 Balimbing trees and I learned how to pick the sweet ones.I have seen them in US markets but quite expensive.I am glad to see old favorites. My childhood home had a balimbing tree close to the front gate. As a kid, I would climb the fence so i can harvest all the balimbings in sight, even the super unripe ones (“bubot”). My brother and I would cut them up into tiny stars and soak them for an hour or so in a mixture of cane vinegar, soy sauce and salt. Then we’d use a toothpick or chopsticks (I mastered the use of chopsticks with balimbing stars) to fish them out of the pickling liquid which we also sip in between bites. Another way we prefer to eat the fruit is by biting off the edges of the “stars” then eating the “arms” one by one. This was dipped in rock salt or cane vinegar (Del Monte, if I recall correctly). The tree we had was the local variety, not the huge ones that grew as large as my hand and were yellow and sweet when ripe. The local ones were also yellow and sweet when ripe, only in miniature. I once spent almost $5 for a single balimbing fruit (a big one, about 5 inches long)–I was so happy to find one in the market I didn’t mind the cost anymore, esp since it was Xmas time and I used the slices to decorate a dish I was bringing to a party. I believe it’s called a “starfruit” here, bec of its shape when sliced. However, when my mom found out how much I paid for it, she wasn’t happy about it. Couldn’t blame her either. Imagine, paying 250+Php (when the exhange rate was still 56 Php to $1) for a single carambola! Your post feels so apropos for Earth Day! Stunning shots! I watched 11th Hour, Leo di Caprio’s documentary on climate change and the catastrophic consequences. It’s good that we can “document” the glory of nature while we can! Thanks for the lovely post, MM! apart from using them in salads or eating them raw with salt, are there other ways of using balimbing? Wow, the lowly balimbing tree has evolved in MMs pictorial. I did not realize that even the flowers are quite pretty. I wonder why turncoats & traitors are called balimbing, any idea? out of curiosity, I once tried a cup of balimbing juice in one of the juice stalls at a night market in Taiwan… I almost spit it out immediately because it tasted like liquid champoy yuckkk! had to walk four blocks with a full cup of juice until I finally found a garbage bin. turncoats are called “balimbing” because the fruit itself has many sides. in other words, many faces “doble kara” etc. 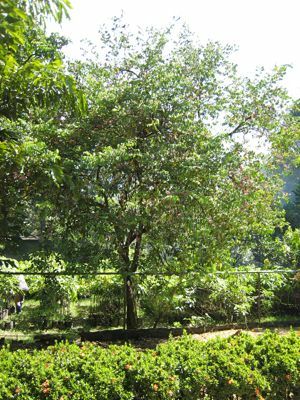 My lola had a balimbing tree,and not too far away from it, was a kamias tree. It would bear fruit, but it was always tart, just a little less tart than the kamias. Siopao, thanks that is enlightening. Whoa! Definitely childhood memory overload. First makopa, and now carambola. How about camachile (sp?) – have you run across that lately? Imagine something we take for granted costing a lot in other countries. I love balimbing and it was one of three choice fruit trees in my vacant lot. I should try putting it in cocktails or salad! As kids, the balimbing tree was one of our favorite hangout place in my lola’s yard. All the cousins played and chased each other there. Afterwards, we would pick ripe balimbings and slice them into stars. It always tasted better with sprinkled salt or patis. My lola just passed away a few days ago. But, fond memories of her and the balimbing tree will live on. I love this kind of post–such a pretty tree and balimbing fruit are quite high in vitamin C MM please keep your “records” coming–we’ll all enjoy them! Being closely related to kamias, balimbing trees seem to exhibit a stretched-out fruit-bearing season though unlike kamias trees, do not renew themselves seemingly continuously that mature people who act and dress inappropriately young for their age were usually described as â€œnagmumurang kamiasâ€ in my town. Apicio, I am amazed by your linkage of fruit to commonly used descriptions… now that I have returned to the chico grove in Cebu, I totally understand the amoy chico comment as overripe chico by the thousands smells like a hundred drunks in a closed room… and the kamias description is another revelation… we should have a post solely devoted to such fruit and vegetable related linkages… evel, I have several posts in the archives, but the one on mansanitas was controversial as I wasn’t sure what the fruit was… and there is a post on camachile in the archives for silly lolo. By reading your post, I can tell Summer has arrived. Growing up, we had several fruit trees that surrounds our home in Davao. We take our pick from whatever strikes our fancy that day, from Balimbing, 4 different varieties of Guavas, Siniguelas, Tambis, Chicos, Carabao Mango, Marang, Pineapple, dwarf Macapuno coconut and some itty bitty round fruits that were stupendously sour. These fruits were in our fenced yard alone. However, if we want more… Atis, Durian, Jack Fruit, different varieties of Bananas, Santol to name a few, we go to my Lola’s home nearby. Yes, those were memorable Summer days. My lolo’s front and backyard in Bulacan are sorrounded by fruit bearing trees, including balimbing, duhat, santol, langka, guava, indian mango, suha, kamias, atis, chico, and he even had a grape vine bearing grapes as sweet as kamias ;-) So come summer we get to taste all their sweet fruits. And everytime we ask why they are sweet, he always says, it’s been watered from our lola’s arinola,,,,hahaha. Good morning everyone! I just noticed how much this tree seems to have really rooted (pardon the pun) itself to childhood memories of more than 1 commenter. Balimbings and ancestral backyards seem to be a natural pairing… hehehe!!! I agree! A post on fruit/vegetable-linked decsriptions would be a good read! I personally still use “nagmumurang kamatis” or “nagmumurang kamias” to describe a certain actress who is already mature but dresses like a teenager, “amoy chico” to desccribe my friends who guzzle a cheap brand of brandy/rum, “balimbing” for an ex-officemate who sides with whomever is in power (can you spell politician? hehe), and “mala-chesa” for something that is disgusting no matter what you do to it (kind of like “a wolf in sheep’s clothing is still a wolf”). MM, I think the scientific name for mansanitas is jujube. The fruit they say is an expectorant to relieve coughs. The leaves is an astringent in dysentery and diarrhea according to rural folks. I am reminded of the balimbing tree in my lola’s house in Tarlac. Her house is surrounded by other fruit bearing trees, starapple, guava, duhat and that balimbing tree that I can see from the room we sleep in whenever we visit. The fruit is kind of tart which we offset with rock salt. Oh those beautiful childhood memories of days gone by. We have a balimbing tree too!!!!!!! And…yupzee! Balimbing is so yummy! I remember it calling a wishing star apple when i was 7 years old, and i keep wishing on it every time i bite it. And yes! It’s yummier when it is dipped in salt! hope you’ll still continue posting balimbing images. favor… could you include mansanitas?